If the Irish Examiner were intending to start a real debate about Autism in Ireland they have gone the wrong way about it. Their publication of a frankly, disastrous article by Tony Humphreys has been met with widespread anger amongst those working and living with autism. 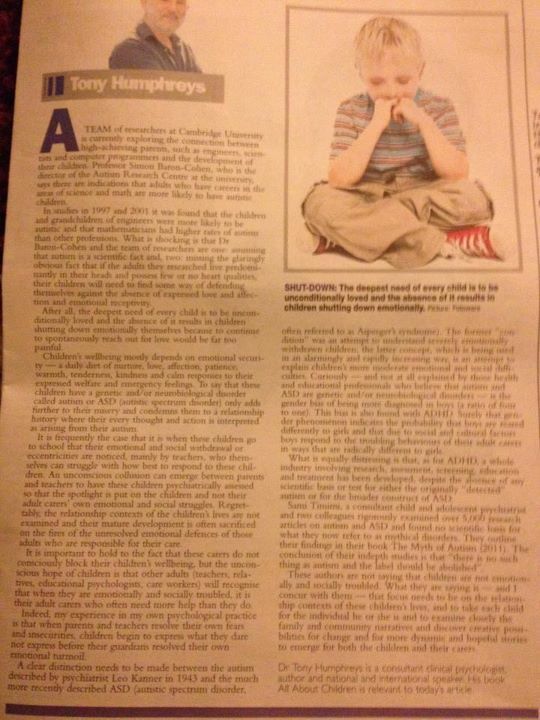 I'm not an expert on autism so, unlike Humphreys, I will not attempt to put forward my views here. Humphreys' views have been pretty comprehensively trashed here, here, here, here and in a number of other fora. The part of the article I will attempt to grapple with is this. In the opening paragraphs, Humphreys cites some indications that children of engineers, scientists and mathematicians are more likely to be autistic than other children. The argument seems to be based on research by Prof Simon Baron-Cohen from Cambridge. Speaking about the work elsewhere, Baron-Cohen explains his hypothesis that these parents are more likely to be 'systemisers' - working on tasks and projects which require them to look at systems and how they work such as computer programming, engineering, etc. An interesting hypothesis and the results of the study should be published this year. Baron-Cohen and his researchers are "missing the glaringly obvious fact that if the adults they researched live predominantly in their heads and possess few or no heart qualities, their children will need to find some way of defending themselves against the absence of expressed love and affection and emotional receptivity" he wrote. "After all, the deepest need of every child is to be unconditionally loved and the absence of it results in children shutting down emotionally themselves because to continue to spontaneously reach out for love would be far too painful." If we read through the psychobabble, what Humphreys is saying here is such a stereotypical and insulting view of scientists and engineers that it is really worth tackling. 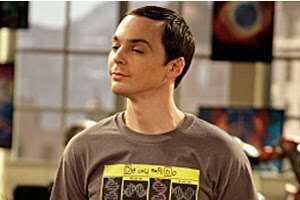 His argument that scientists and engineers are lacking "heart qualities" (whatever they are) like Data from Star Trek or Sheldon from The Big Bang Theory would be hilarious were it not equally so insulting. As a scientist and expectant father, I take offence at being labelled so ridiculously in this way. Humphreys article is lacking in almost any real science - perhaps this explains his stereotypical view of the scientific community. The Irish Examiner, unfortunately has decided to support Humphreys, while carefully perched on the fence. In an editorial published this morning they expressed "regret" for the "obvious hurt caused by Dr Humphreys’ comments" but, they stood by his right to express them. The editorial made clear that the paper had been heavily criticised for publishing the column in its Feelgood supplement, which is distributed in print form only every Friday. The newspaper published a number of letters concerning the article in today's edition. Of the seven letters published, just one was supportive of Humphreys. Prof. Kevin Mitchell, professor of genetics and neuroscience at Trinity wrote that Humphreys' article showed "such willful ignorance, lack of understanding and density of inaccurate and offensive statements that it is shocking that the Irish Examiner would publish it". "This kind of psychobabble", Mitchell said "has been discredited for decades". It's interesting that in a week that has seen the Chairman of Thomas Crosbie Holdings (the media group that publishes the Irish Examiner) call for a share of the new public service broadcasting charge, the newspaper should publish an article which does so little service to the public. Alan Crosbie noted that "Public service is not something RTÉ owns…It is a public service for any organisation to devote professional people to finding out, fact checking and publishing information in the public good". It's unfortunate then, that given the supposed public service element of the Irish Examiner and the layers of reporters and editors involved, that the newspaper allowed such an article to be published. That they stand by it in today's editorial is even worse. 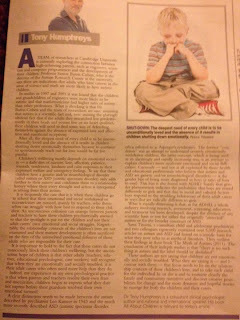 A close friend of mine is a houseparent for Irish Society for Autism- what is going on in the Examiner that this even got published?? This is not misinformation, it's DISinformation! Thank you for responding to the article. What I found particularly disingenuous about the article was that it wasn't presented as 'opinion'. Tony Humpheries used his full professional title and then quoted a supposedly scientific meta analysis to support his views while debunking a proper scientific study. What was his proper empirical evidence for disputing the Baron Cohen study? None. Instead he appealed to the "glaringly obvious fact" (not very scientific, that remark)as you say that the lack of heart qualities would make children turn inward. As you say today's editorial does not help. Professionals in an area should not be allowed free reign to spread bias and misinformation. I don't believe it is ethical to do so. Worse than no apology at all. I'm a high Systemizer according to Simon Baron Cohen's online survey. I am also a high Empathiser! so not only can I pick out the Ikea furniture, I can assemble it from Flatpack. Seriously - as the mother of 2 severely autistic children I have learned to use the power of my own Aspergian tendencies to pursue the route to the best possible services for them . I have also made it my life's work to give people with autism the ability to communicate independently, in a way that is controlled by them and is universally understood -with the App I named after my daughter Grace. I did this not because I am a clinically brilliant Silicon Valley Coder Genius ( I Am SOOO NOT) but because I felt that Grace had a right to tell me what she really likes and for me to use that to understand her. Because that understanding leads to trust and a real bond where I can take a step in to her world and encourage her to be part of mine. This nonsense being portrayed firstly as "expertise" then "opinion" is only perpetuating the myth that autism is not a real disability and therefore should not get the state funded allowances so crucial to allowing us to give our children the best possible support. Thank you for your informed explanation. i have no title i am just a mam with an asperger child, i left school at an early age and the only experince i have are life ones. you will even see my spelling is not very good.he is very loveable and has a fantastic mind, and has so many hurdles in life to get over that he can do without your negative opinion thank you. there isno one else autistic in my family.we should be learning from these children and trying to understand them for our future and theirs. Simon Baron-Cohen has already distanced himself from Tony Humphreys ignorant drivel, now Sami Timimi has said that it completely misrepresents his work as well, and is offensive (RTE Radio Liveline in Ireland). "Tony Humphreys' assertions made in the article are not supported by the vast body of research in the field of Autistic Spectrum Disorders and are unhelpful and likely to cause upset. It is hoped that the article would be retracted." The Psychological Society of Ireland is the learned and professional body for psychology in the Republic of Ireland. Autism Spectrum Disorder (ASD) is a neuro-developmental condition that is characterized by impairment in social interaction, communication and repetitive behaviours. The condition affects one in every 100 children. IT APPEARS TO ME THAT IT IS NOT SAFE TO HAVE AN OPINION WHICH DIFFERS TO OTHERS ON THIS PAGE. IT APPEARS TO ME THAT IT IS NOT SAFE FOR ME TO HAVE OPINION WHICH DIFFERS IN ANY WAY FROM THE OPINIONS WHICH ARE POSTED ON THIS PAGE. ITS NO SUPRISE TO ME THAT ALL COMMENTS HAVE TO BE VIEWED BY THE BLOG AUTHOR BEFORE I'M ALLOWED HAVE AN OPINON. THIS IS A ONE WAY DEBATE ON THIS PAGE AS FAR AS I CAN SEE, WHY NOT OPEN THE FORUM FOR ALL OF US TO HAVE OUR SAY. AS FAR AS I CAN SEE ITS NOT SAFE TO HAVE AN OPINION WHICH DIFFERS TO THE COMMENTS POSTED ON THIS PAGE. I THOUGHT IT WAS A FREE COUNTRY SO OPEN THE BLOG UP TO EVERYONE WHO WANT TO PARTICIPATE IN THIS DEBATE. Do you have an opinion you'd like to share? It wasn't clear from any of your five comments what point you were making - in fact, all were identical to the one you've posted above. If you'd like to comment on the above post, please do so, but it will be vetted and approved in exactly the same way as all other comments. Actually, I would really welcome informed opinion about or in support of Dr Tony Humphreys. I disagree with every aspect of his article, but the most fascinating and insightful thing all week was when someone posted his interview on the Marian Finucane show - the only comment he himself has made to clarify the original article. He clarified that parents CAUSE rather than are TO BLAME for autism, other than that it was a total affirmation of his position. I know he has many supporters and is a regular at conferences where, presumably, other psychotherapists support his Bettelheimian approach to developmental disorders. I really do want to hear what they have to say.